French cartoonist Wild was on the verge of homelessness when he received a job offer that would take him to Afghanistan. His travelogue explores life in the country with candor and humor, particularly the places where the cultures diverge and, sometimes, overlap. "An autobiographical scream from start to finish." "I did enjoy his trip to the mountains of the giant Buddhas and his portraits of everyday life; however, I left longing for more: more information, more landscapes, and more details." "Superb. . . . Captivating, warm, funny, scarily informative and unobtrusively polemical . 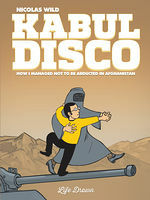 . . a wittily readable, non-discriminating reverie that informs and charms with surprising effect: the perfect response to the idiocy of war and dangers of corporate imperialism as well as a sublime tribute to the potent indomitability of human nature." "A truly unique perspective on an entire generation's desire to simply get lost. . . . Nicolas Wild's compelling travelogue/memoir will get you thinking about where you stand and where you'd like to go." "Wild strikes a self-mocking tone that allows his cultural observations to feel genuine and well intentioned, not judgmental." Funny. Yet, heart-felt, poignant and a great look into a country constantly in news for all the wrong reasons. A recommended read for novices to the country and its history. 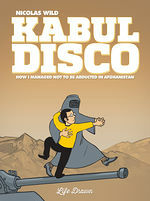 It is through these observations that Wild captures and provides a poignant view of the Afghan lifestyle and society. From outlining the simplicity and the abject poverty of the locals to the luxuries enjoyed by the privileged and pretentious European bourgeoisie, Wild manages to paint a vivid picture that depicts both sides of the coin. 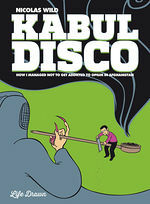 Both enlightening and fun, Kabul Disco is a great surprise. Half-way between an illustrated travelogue and a memoir, Kabul Disco is a patchwork of entertainingly hilarious anecdotes, sweeping away any prejudice against Afghanistan, a country usually only seen through the lens of mainstream news media. The subjects tackled range from child labor, religion, history, propaganda, curfews, and kidnappings to the fancy parties of the privileged.